This Vegetable Soup Recipe is a delicious restaurant soup recipe. You'll be delighted with the subtle blend of flavors in this restaurant soup recipe. Preparation time: 30 minutes. Servings: 8. Ladle the soup into your soup bowls and if you like green onion, garnish the soup with a few and ENJOY! 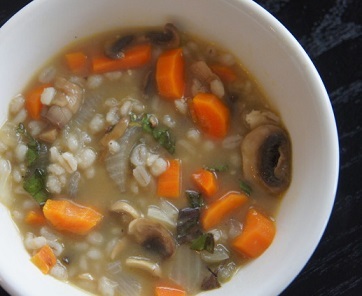 If you like a thicker soup increase barley to 1/2 cup and add more carrots. 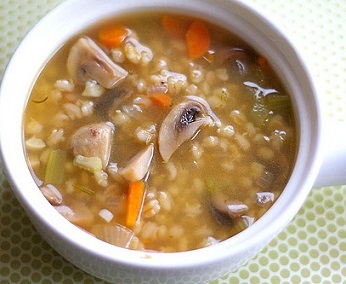 This vegetable barley restaurant soup recipe is enhanced when served with dinner rolls or cornbread! Here's something else you can do with this restaurant soup recipe. For a totally vegetarian soup, substitute vegetable stock for the chicken stock and the soup will turn out just as fabulous! Thanks for finding the website! Come back often for more great customer requested restaurant recipes. Don't forget to share this website! ENJOY your restaurant vegetable soup and the company of those you share it with! Did you know? Barley is a wonderfully versatile cereal grain with a rich nut-like flavor and an appealing chewy, pasta-like consistency. Its appearance resembles wheat berries, although it is slightly lighter in color. Sprouted barley is naturally high in maltose, a sugar that serves as the basis for both malt syrup sweetener. When fermented, barley is used as an ingredient in beer and other alcoholic beverages.